Perhaps you have heard about the benefits of raw feeding and would like your dog to try it. Possibly you already raw feed and would like someone else to prepare the food for you. Maybe you have a poorly or overweight dog and need advice. Whatever your situation Honey’s, a small, ethical, family-run, artisanal dog food company, can help. 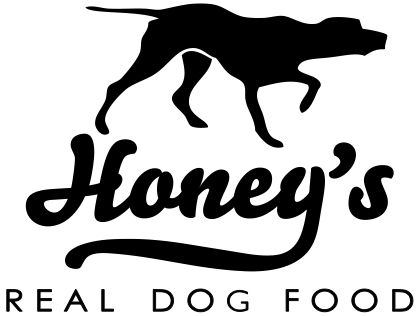 Honey’s, which is located in Wiltshire but ships all over the country, produces a wide range of complete raw dog foods. Why raw? There is growing evidence that dogs live longer, healthier and happier lives if they eat the same sort of diet they would enjoy in the wild. That is to say: raw, fresh meat, bones and vegetables. Dogs and their wolf cousins have been eating raw food for over a million years and they thrive on it. The health benefits are massive and proven. If your dog has any health issues a raw food diet could make a huge difference. Honey’s will design a diet just for your dog, taking into account his or her age, weight, preferences, allergies and any health issues. They’ll ask you for a photo or video, too, as they like to get a proper feel for every dog they feed. All their ingredients are ethically sourced (free range, wild and/or organic), British and suitable for human consumption. The Honey’s service is unashamedly traditional. They are happy, for example, to provide you with unlimited nutritional advice (including DIY recipes, help with weight loss and access to their vets and veterinary nurses) free of charge, even if you never, ever plan to become a customer. Honey’s Half Price Hamper offer means that you can try raw feeding and the company out for just £30 including delivery. Call 01672 620260 or visit www.honeysrealdogfood.com for more information. I cannot thank honeys enough for the continued help and support they have provided,. Their food is amazing and their ethics outstanding. Please keep up the great work honeys, we truly appreciate you. We (3 rescues and me) have been rawfood Honey’s fans since we started using their excellent produce about a year ago. As a vegetarian myself, I like that the meat is ethically sourced and tested. Our 12-year-old Ellie (lucherxsaluki)’s ‘greyhound tremors’ (age-related) decreased by about 90% within less than four months. As if that was not enough evidence, she and our other elderly lady (11-year-old saluki x) had bad breath before we started, and that has reduced so as to be barely noticeable. Their pee no longer burns the lawn, and their poo is easy to scopp and barely smells (bonus for me!). Like a typical teenager, our new youngster still has to learn to like veggies however; but Honey’s also do a veg-free version while she slowly gets used to them. Love the personalised service and that they are readily available with helpful advice. I am a behaviourist and trainer. I have raw fed my dogs for many years because of the health benefits and I can highly recommend Honey’s Real Dog Food. The quality of their food is excellent and importantly ethically sourced. Their customer service is second to none and they are always happy to answer questions and support the first-time raw feeder. I often recommend their two books by Vicky Marshall and Jonathan Self to my clients. They are excellent plain-English books for anyone wishing to learn more about what is in their dog’s food and how to feed a balanced raw diet. I can’t thank the honeys team enough for their help and continued support with my poorly dog. Their food, ethical values and service are exceptional. Honey’s make raw feeding the accessible, easy, logical, health-giving choice for all discerning dog (and cat) lovers. this company provides the highest quality dog food, with an ethical stance. The food comes in a wonderful variety of flavours, as well as enough bones, wings etc for raw feeders who like to be in control of their dogs food. But what really makes this wonderful company stand out is the customer service, warm, helpful, human, nothing is ever too much trouble, they know the products intimately and so are able to give helpful advice. I have used them for many years now….and I wouldn’t consider using other food, my rescued hounds would never forgive me! Quality food delivered to your door in excellent condition. Honeys will discuss your dogs requirements and advise on the right amount of food to feed and give good nutritional advice. Our Springer Spaniel “Rosy” thrives on it. Always getting comments on the quality of her coat. Couldn’t recommend highly enough. Honey’s raw dog food is exceptional. My dog has been raw fed since 9 weeks old – we have been feeding Honey’s for two months now and it is the best supplier we have used. The food is ethically sourced and of the highest quality – their mince in particular is coarser than some other brands and this suits my fussy Westie! Furthermore the Honey’s team is always on hand for advice – when my dog has been poorly they have been a great support. I would not hesitate to recommend this company to a novice or expert raw feeder – they are brilliant.